Paul LePage told lawmakers that Mainers want action, "not small talk"
Maine's Republican Gov. Paul LePage second-term policy priorities include slashing the state's income tax, creating a tiered welfare system and regionalizing services. After taking the oath of office in front of 3,000 people at Augusta Civic Center on Wednesday, LePage said that his two-year budget proposal on Friday will seek to reduce the state's income tax, which he says is essential to making Maine competitive. "The people of Maine have told us they want want better jobs. 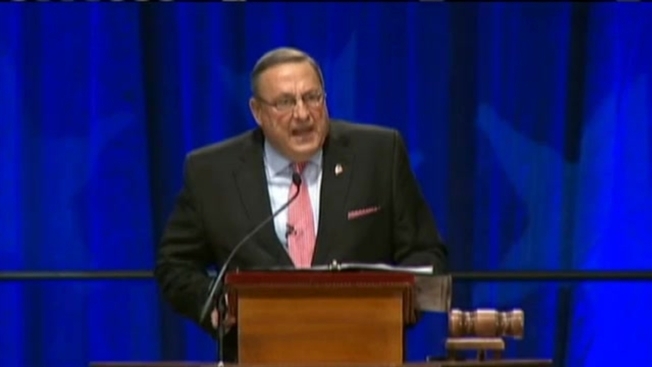 They want welfare reform, lower energy costs, and lower taxes," said LePage. While he didn't say how he'd make up the lost revenue, the governor said lowering the state's income tax will be a priority in his second term. Raimondo Inaugurated as RI's 1st Female Gov. "You earn it. You should keep it," said the governor to rousing applause. The governor also wants to create a tiered system of welfare so that people are weaned off of benefits, instead of losing them immediately. The governor's initiatives will only work if the legislature cooperates, which was not the case during the last session when Democrats controlled both the House and Senate. Now, the legislature is divided with Democrats controlling the House and Republicans holding a majority in the Senate. House Speaker Mark Eves D-Berwick says his party will look for common ground. "What we know we can agree on is a focus on jobs and the economy," said Eves. And Senate President Mike Thibodeau R-Winterport said he liked what he heard about tax reform. "Wouldn't we all love to have less income tax and lower the tax burden on Mainers?" he asked. LePage also called for services to be delivered in a more regional basis. He applauded areas like Washington County, where 18 municipalities are operating a regional EMS system. LePage told lawmakers that he wants to work with them this session, but said Maine people want action, "not small talk." Like many inauguration speeches, the governor's proposals were short on details; but he promised they're on the way when he presents his two year budget to the legislature this Friday.